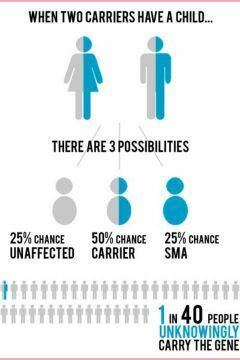 SMA Information: Did you know? Spinal Muscular Atrophy is a recessive genetic disorder. Here is a graph to explain how you, or those you know may be affected. Two Cure SMA-funded projects have recently been published. Diane Murrell and her team published the paper, "The Experience of Families With Children With Spinal Muscular Atrophy Type I Across Health Care Systems" in the Journal of Child Neurology. Deborah Boroughs' paper, “An Evaluation of a Continuing Education Program for Families of Ventilator-Dependent Children with Spinal Muscular Atrophy (SMA)”, was published in Children. On December 23, 2016, the FDA announced that it had approved Spinraza, a treatment developed by Biogen and Ionis, making it the first-ever approved therapy for SMA. Cure SMA provided the very first research funding for this program beginning in 2003. The drug pipeline also tracks the implementation of this and other therapies as they are approved.